Carnivores only eat other animals. They do not eat any plants. Harpy Eagles, Jaguar, and Piranhas are some of the carnivores that live in the Amazon Rain Forest. This is where they are in the food chain: plants > herbivores > carnivores. At the top of the food chain and one of the larges snakes in the world. 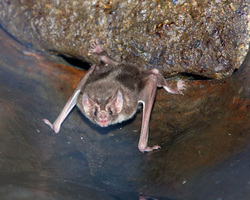 Lives on the banks of the amazon river and spends time in the water. 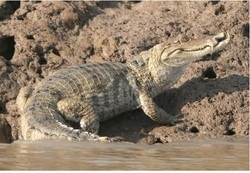 They eat large rodents, small mammals, frogs, fish, and even crocodiles. Man is the only known predator. Grows in the understory and canopy. Gets its nutrients from eating insects. Found in the rivers, streams and deep areas below waterfalls in the Amazon. They eat smaller fish. 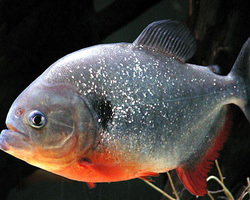 Larger fish and small mammals may be attacked if there is a school of piranhas. Lives mostly in the understory layer. 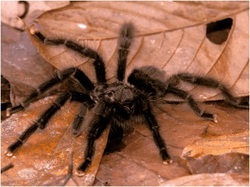 Eats insects, such as grasshoppers, millipedes, beetles, other spiders, and frogs, even rodents and small birds. Its only real natural enemy is an insect known as the spider wasp. 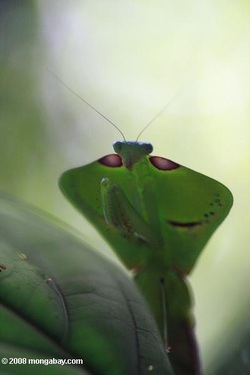 They eat insects and other invertebrates like other mantises, beetles, butterflies, crickets, grasshoppers, and even spiders. 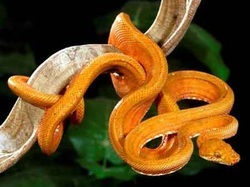 They also eat vertebrates such as small tree frogs, lizards, mice and hummingbirds. 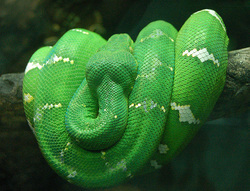 Its main predators are frogs, monkeys, larger birds, spiders and snakes. Caimans eat fish, crabs, and shrimp. Would you eat a Caiman? 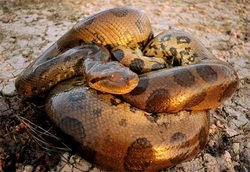 Can't think of anything that would, other than that pesky anaconda - a really big one! Lives in the Emergent layer. Eats mostly small birds. This eagle eats everything and only a few animals are not threatened by these birds, such as Anaconda and Jaguar. 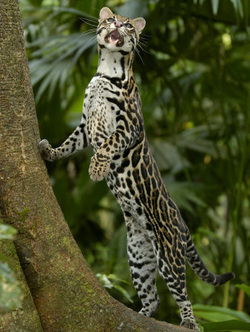 The largest and most powerful member of the Amazon cats – top of the food chain and among the largest living cats. They often hunt close to water for large animals on the forest floor such as peccary, deer and capybara. They will also take birds, fish, turtles and smaller mammals. Jaguars rarely venture into the trees. You're best chances of seeing a jaguar are if you are in a forest area, near a stream, close to nightfall. This animal is so rare that it is estimated that there are only 200 total in the Amazon Rainforest. The jaguar is endangered so you are very unlikely to see one in the wild. Is eaten by harpy eagles, humans, and saddleback tamarins. The Amazon River dolphin can be found in the Amazon River system as well as the Orinoco River system. They eat over 50 types of fish as well as crustaceans found on the river bottom and the occasional turtle. 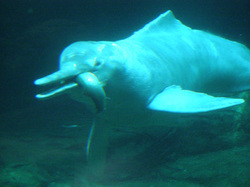 Human activity is the main threat to the Amazon River dolphin. The dolphins often become tangled in the nets of fishermen and die. The building of hydroelectric dams in South American rivers, pollution, the loss of habitat and decrease in food sources are all threats. The most common rainforest cat, but is nocturnal and rarely seen. Much smaller than the jaguar and eats smaller mammals, mostly rodents. When it gets the chance it will eat birds, lizards and snakes. This cat is widely hunted for its skin and is on the endangered species list.